Well, this is certain to ruffle a few feathers. A new study claims that, when it comes to losing body fat, it’s better to cut fat from your diet rather than carbs. 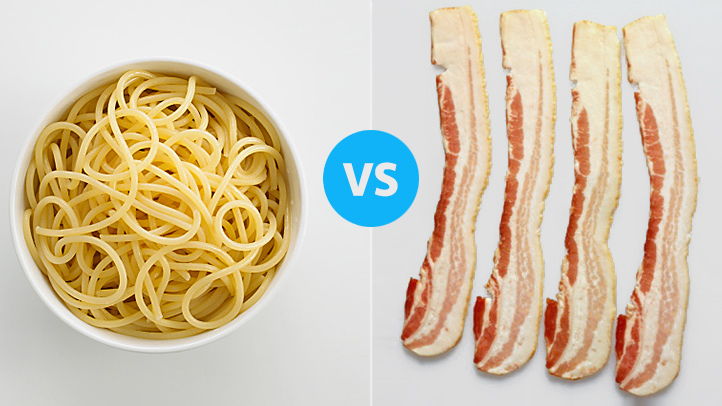 Let the games commence.The debate of low-fat versus low-carb diets has long been raging, but this study by the U.S. National Institutes of Health, published in the journal Cell Metabolism, stakes its claim on the low-fat side. In the research, 19 obese adults were closely monitored in a ward for two 2-week periods. During their time on the ward, every single morsel of food eaten was monitored and controlled. In the first two-week period, 30% of their calorie intake was cut through carb restriction, with fat intake remaining the same. In the second two-week period, the variables were reversed. And now the important bit. It was found that on the low-carb diet, the participants lost an average of 245 grams (0.54 pounds) of body fat. On the low-fat diet, they lost 463 grams (1.02 pounds). However, he cautions against anyone making dietary decisions based on this research just yet, not least because of the limited sample size – 19 people – of this study. Further research, though, could continue to fuel the flames in one of the great dietary debates. “We are trying to do very careful studies in humans to better understand the underlying physiology that will one day be able to help generate better recommendations about day-to-day dieting,” added Hall in the statement.